Fields in a Podio webform are empty by default when the page is visited. In this section you'll learn how you can pre-fill fields in your webform by adapting the URL of your webform. Note: prefilling webforms is also possible for embedded webforms. Go to step 7 to learn more about this. Go to the app which webform you’d like to prefill. Open the app menu and select the option “Developer”. To get the form URL go to the webforms overview page and click on Share in the menu bar. The form URL will be shown in the Share box. 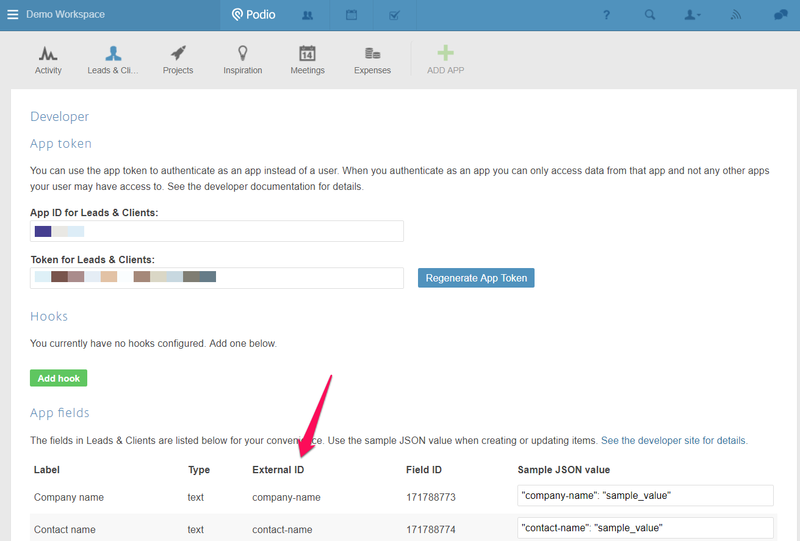 Podio has a many different types of fields. The text field we’ve used so far is simple as it’s a single value, but other fields like category or relationship are more complex. To complete this tutorial, here is a complete overview of the supported field types and what format you need to use to prefill them. For category fields you need to use a different syntax to pre-fill the values. In this case you need to specify which label id (1, 2, ...) you would like to check. Click here to find out how to get the label IDs. To pre-fill values for embedded forms, you can add a value to the attribute data-prefill in the embedded code.